What colors can I use in the data file for the color column for my Surfer post map? You can specify the colors by their name or by RGB or RGBA color classification. The RGBA classification stands for Red, Green, Blue and Alpha (opacity) and the values can range from 0 to 255. For example, you can enter Sky Blue, R105 G5 B105, or R105 G5 B105 A135. 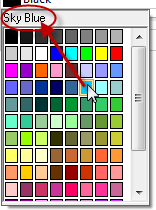 The color names that you can use in the worksheet can be found in the color palette. is displayed at the top of the color palette. How can I define the color for each post map symbol in the Surfer worksheet? Can I indicate the symbols I want on my Surfer post map using the symbol index? Can I load a CLR file for a contour map via Surfer automation? Can I set the color or opacity of symbols in a Surfer post map to be based on a Z value? How do I change the individual bar colors of my bar chart in Grapher?